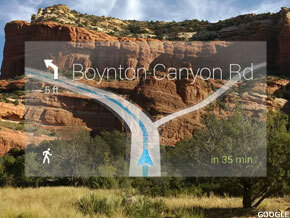 Google has set up a Web site showing off Google Glass and what it can do. NEW YORK ( TheStreet) -- Google ( GOOG - Get Report) Glass is closer to becoming a reality for everyday users, not just developers. The search giant has shown off its new eyewear technology in a series of videos. 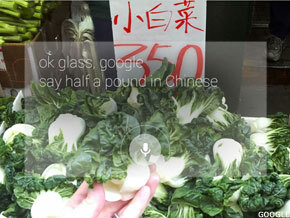 Consumers can apparently use the phrase "Okay Glass" to start a slew of commands for the device. The technology comes in five colors: charcoal, tangerine, shale, cotton and sky. Users are able to send messages, record videos, take pictures and conduct searches using Google Glass, which was first shown to the public at Google's I/O developer conference in June 2012. There are a slew of pictures on the site that show how Google Glass will look. There's also a video demonstrating how the technology feels while you're wearing it. This could be another foray out of Google's core business, but eventually ties it back to what it does best, advertising and search. Hudson Square analyst Dan Ernst says Google is doing this to keep the long-term in mind and keep innovating. Google Glass "ties back to their core business of providing users access to information, and advertisers access to their users," Ernst wrote in an email. Initially aimed at developers, Google has now announced that it will give Google Glass to people who can use it creatively. "We're looking for bold, creative individuals who want to join us and be a part of shaping the future of Glass," the company wrote on its Web site. Users can submit short applications to try and win the right to use the new computerized eyewear. Google Glass isn't the company's first foray into its own hardware. As the tech giant tries to become more of a hardware company and compete with the likes of Apple ( AAPL - Get Report), it has already launched its own tablets and smartphones (the Nexus line). Google has also partnered with PC makers to create computers that run off its Chrome operating system, designed to compete with the MacBook Air and ultrabooks. Last year, Google acquired Motorola Mobility and is reportedly working on an X Phone, designed to be an iPhone killer. The Glass project shows that innovation is alive and well at Google. Brian Sozzi, chief equities analyst at NBG Productions and a RealMoney contributor, says Wall Street is underestimating what Google has in the pipeline. "For years, Google has been perceived as investing in products that never seem to come to market," Sozzi said in an email. "But, with pictures of a self-driving car floating around the Internet, and Google Glass set for release, it's very apparent years of investment are about to be unleashed into the everyday environment." Rumors have circulated recently that Google may launch retail stores to help show off projects such as Google Glass and various Google-branded hardware. According to sources close to the situation, though, the rumors could be overblown. 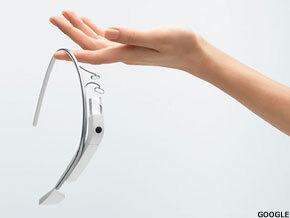 Google Glass is set to be released next year for consumers. Developers are expected to get it later this year at a cost of $1,500 per unit. Shares of Google were lower in Wednesday trade, off 0.9% to $799.42.